As the Senior Partner of the Direct Group of Cheddleton in Staffordshire, we feel that Direct Parts Limited has firmly established itself as the number one supplier of Power Steering and Hydraulic fan equipment. Since our conception in 1993 the product range has further extended itself to include front axles, rear axles, calipers, compressors, steering columns and linkages. Direct Parts Ltd provides nationwide coverage to all of England, Scotland, Wales and Ireland, from our centrally based operation near Stoke-on-Trent, Staffordshire. The company’s customer base includes National, Regional, Independent Bus & Coach operators. Further acknowledgement of this market leading product range is the fact that Original Vehicle Manufacturers onward supply the Direct Parts range further endorsing our portfolio within the UK and beyond. HGV and 4×4 are also included. The depth of our product range calls on all the companies within the group, machined parts from Direct Development Engineering, new infill of pumps and motors from Direct Limited and finally proving out our product with the technical input and specialist testing equipment from Direct Hydraulic Services. All companies within the group are registered to the ISO9001 certification. The extensive diversity of the vast range of service exchange Power Steering is a true master class in engineering to OE or above standard. Hydraulic fan equipment needs that special expertise to ensure every unit meets the exacting standards laid down by our discerning blue chip customer base. Extensive research and stringent testing is an everyday company practice to ensure all calipers are produced to the highest standards. Careful selection of third party supplied parts and continued training to the “Best of Practises” standards are laid down to ensure our vehicle air compressors produce the results you are looking for. The All makes front axle program is already a market leader. 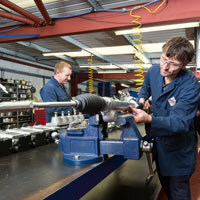 The careful attention to detail and the methods adopted ensure every axle is to the highest standard. The Direct produced axle saves downtime and with a substantial financial advantage. Follow this link to view all Direct Parts Ltd products.